For years, the Social Security Administration has warned lawmakers that unless they do something soon, the entitlement program for disabled workers will run out of cash by 2016. Still, as the program’s funds dry up and its insolvency hovers less than two years away, Congress remains quiet on the issue. 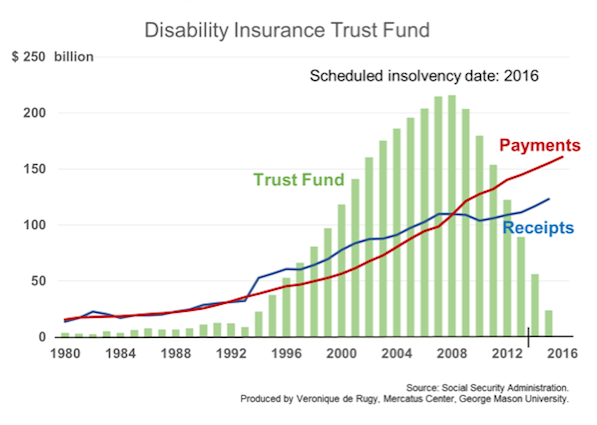 More than 11 million Americans currently rely on Social Security Disability Insurance (SSDI), which was created in 1956 to provide financial assistance to people unable to work because of severe health issues. Americans using the program, which is funded through the federal payroll tax, currently collect an average $1,129.51 per month. Most of the beneficiaries rely on disability for a significant portion of their income. Officials estimate that the majority of them never return to the workforce and remain dependent on the government. The program has swelled in recent years—with rapid growth driving it full speed ahead to insolvency. Social Security officials say the increase is related to a number of factors including the aging population as well as a larger number of working women eligible for the program. Others say the spike in beneficiaries is largely due to a 1984 policy change that expanded the qualifications for disability. Economists at the National Bureau of Economic Research, Mark Duggan and Scott Imberman released an analysis that found that relaxed medical eligibility criteria was the biggest factor driving the increase in disability beneficiaries. Regardless of the reason, the number of beneficiaries has increased and naturally, so has spending. According to the Social Security Administration, spending on the program has more than tripled since 1983 from $43 billion to $139 billion, adjusted for inflation. It now accounts for about 20 percent of the Social Security Administration’s total budget. Spending has ticked up so fast in recent years that revenue can’t keep up. The government has paid out more than it has taken in every year since 2009, according to the Social Security Board of Trustees. If the pattern continues and the program runs out of money by 2016, the millions of Americans collecting disability will see their benefits cut by at least 20 percent. Yet, agency officials say the entitlement doesn’t have to become insolvent. Congress could go in and replenish the fund. In its most recent report, the Social Security Board of Trustees suggests that one way of doing this would be to raise the federal payroll tax. However, that would be a tough sell on Capitol Hill where any mention of tax increases is taboo—especially ahead of the midterm and presidential elections. The more likely option is to reallocate funds from other Social Security programs, like Old Age and Survivors Insurance- the much larger-known Social Security insurance plan for the elderly. Congress has used this option at least 11 times since Social Security was enacted. The agency says both programs taken together will be solvent for at least two more decades. The last time Congress used this quick-fix plan was in 1994 when the disability program was in a similarly dire financial situation. At the time, they predicted that the same thing would need to happen again in 2016…and look where we are now.